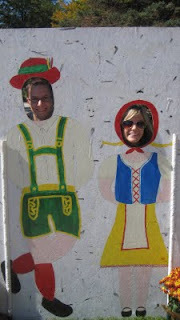 What better way to celebrate our German Heritage than at Oktoberfest! Although we wished we had been drinking a beer stein in the heart of Germany...downtown Ft. Collins was the best we could do. We stood in long lines waiting for steins full of American beer and then again for a Bratwurst and Haschee Knodel. Yes, those are a few German food favorites, for all of you non-German folks! 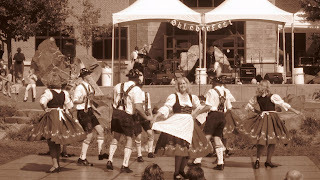 While sitting in the grass, eating our German specialties and sipping our steins we admired the German dirndls, lederhosen, bavarian clothing, fall aromas, german melodies and dances. Look at them go! 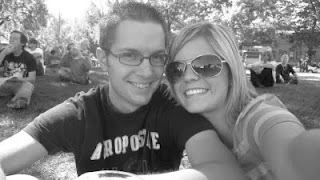 I tried to get Scott to go out and do the Chicken Dance with me, but he wasn't interested.